A police report indicates that D'Anne Leigh Mica, 34, daughter of U.S. Rep. John Mica, R-Winter Park, was arrested today on a charge of driving under the influence. The highly publicized arrest last week of U.S. Rep. John Mica's daughter for driving under the influence has spurred the Florida Republican's political opponents to renew their focus on connections between the congressman's work on Capitol Hill and his daughter's connection to a powerful Florida construction company. Congressman Mica is the ranking Republican on the House Transportation and Infrastructure Committee. His daughter D'Anne Leigh Mica, 34, a public-relations executive, has a web site that identifies one of the largest transportation engineering and construction firms in the country, Florida-based PBS&J, as one of her clients. How much money the company has paid the congressman's daughter is unclear. In an interview on Monday night, D'Anne Mica told ABC News that she never did any direct work for the national contractor, and the public relations job had nothing to do with her father. "My father has no idea what I do in my business. And I have no idea what he does in his," she said. The same is true, she said, about an Orlando area airport that hired her to promote its new commercial air service at the same time her father was helping secure federal aviation funds for the facility. The Orlando Sanford International Airport was also listed on her web site as a client. Questions surrounding the congressman and his daughter come at a time when potential congressional conflicts are garnering close scrutiny. A Washington Post report out Monday focused on the legislative work of Rep. John D. Dingell Jr., a Michigan Democrat, and the lobbying by his wife, Debbie Dingell. Rep. Mica's chief of staff said Monday there has never been any conflict between the congressman's Capitol Hill work and his daughter's small Florida public relations firm, Mica Strategic Communications. The firm opened its doors in 2003, starting as a partnership between D'Anne Mica and a Jacksonville public relations consultant, Mica said. C.L. Conroy, a spokeswoman for PBS&J, said the contractor hired the Jacksonville firm three or four years ago, but not because Mica was in the Orlando office. "We don't remember if we used her or not," Conroy said. Rusty Roberts, Rep. Mica's chief of staff, said he can't figure out why D'Anne listed PBS&J as a client. Roberts initially told ABC News that D'Anne may have helped train company executives to speak effectively on television. But after a conversation with D'Anne, he called back to say she had never done any work for the firm at all. "She says she has never represented PBS&J," Roberts said. "Why did she put it on her website? I don't know." Asked why, D'Anne Mica said she added it several years ago because of her involvement in the earlier partnership. Regardless, Roberts said, none of D'Anne Mica's public relations work has had any bearing on the congressman's pursuit of transportation projects for his district. Forms submitted by PBS&J lobbyists last year indicate the company has pursued the rail project both with members of the House Transportation Committee and congressional representatives from Florida to discuss, though it does not identify which members they contacted. A spokeswoman for PBS&J said there is no connection between the company's lobbying and whatever work it may have offered Rep. Mica's daughter. The company has had its share of tough publicity in recent months, however, related to its efforts to attract business from government officials in Washington and elsewhere. First came a $36 million embezzlement scandal, which led to the conviction of three ex-employees. That led to the discovery of a practice within the company of reimbursing employees for campaign contributions, which is illegal. In September, FEC staff recommended a stiff fine over the alleged use of so-called "straw donors." But Republican appointees on the FEC declined to pursue the matter, because they said the contributions took place too far in the past. Company officials expressed satisfaction with the decision, telling reporters at the time that they cooperated fully, and were pleased to have the matter formally closed. Then, last week came reports of end-of-year filings in which PBS&J informed the Justice Department and federal securities regulators that it was investigating possible crimes involving its overseas construction projects. The company's chief financial officer wrote in an SEC filing that the company was investigating to see whether any of its employees had violated the Foreign Corrupt Practices Act "in connection with certain projects undertaken by PBS&J International Inc., one of the company's subsidiaries, in certain foreign countries." The Foreign Corrupt Practices Act generally prohibits U.S.-based companies from making improper payments to foreign officials, usually through bribes. PBS&J has done engineering and construction work around the world. None of those cases involved Rep. Mica, who came to office in 1992 after founding several successful business ventures, including those in real estate, communications, international trade consulting and governmental affairs. In 2007, Mica's name surfaced in a 151-page investigation called "A Family Affair" by the group Citzens for Responsibility and Ethics in Washington, which found that the congressman was one of 64 house members who had made payments to family members for consulting work on their campaigns. He paid D'Anne $1,000 during his 2002 reelection bid. PBS&J is not the only client with business before Rep. Mica's committee that D'Anne Mica had listed as a client. She was also hired to promote the Orlando Sanford International Airport. Roberts said D'Anne's work for the airport involved promoting the airport in states outside of Florida, and had nothing to do with any congressional action taken by the congressman. "They don't need to hire his daughter to get to know him. If the airport needs help he's going to help them," Roberts said. Rep. Mica has helped secure millions in funding for the airport. As for whether the congressman intervened to help secure the contract for his daughter, Roberts said absolutely not. "She did everything on her own. She never asked him to help and she's never volunteered to help." D'Anne Mica told ABC News the DUI case against her is "pending," but chose not to comment further. 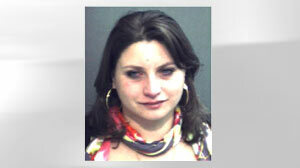 She was arrested in Maitland, Florida on Friday, booked and then released on $500 bail.